How Can Xbox 360 Play DVDs? How to Convert ISO to MKV with ISO to MKV Converter? Many people ask questions like "How to copy a DVD to PC", "how to copy video from DVD to PC" or "how to copy movie from DVD to PC". Actually, for regular DVD discs (homemade DVD discs without protection), it’s quite easy to backup DVD to PC. You only need to insert your regular DVD disc into the DVD drive, right click the DVD drive icon and then choose "Explore", copy and paste the "Video_TS" folder to your PC hard drive. That’s it. However, for non-regular DVD discs, what should you do to copy DVD to PC? This guide would show you how to copy from DVD to PC in 3 different ways for different DVD contents. 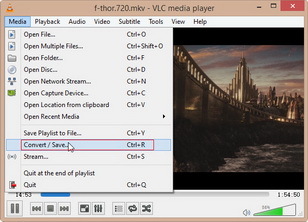 VLC Media Player is actually far more than a simple media player to help you play back most media files. It’s also a DVD ripping software app that could help you rip DVD to PC with its internal Convert function. However, it should be noted that VLC media player only supports ripping regular/homemaded DVD to PC for backup. If you are going to rip encrypted DVD to PC, VLC media player is of no help. 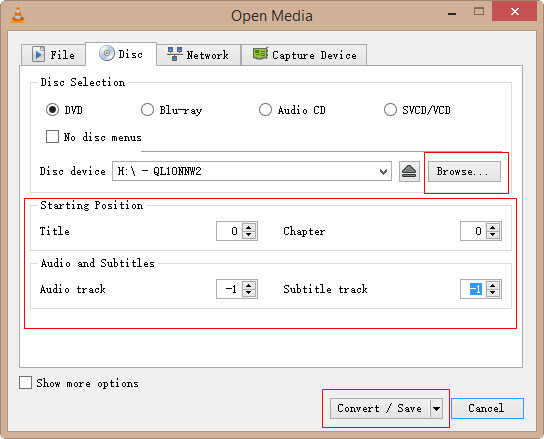 The below steps would show you how to stream DVD to PC with VLC media player. Insert source DVD disc into DVD recorder drive. 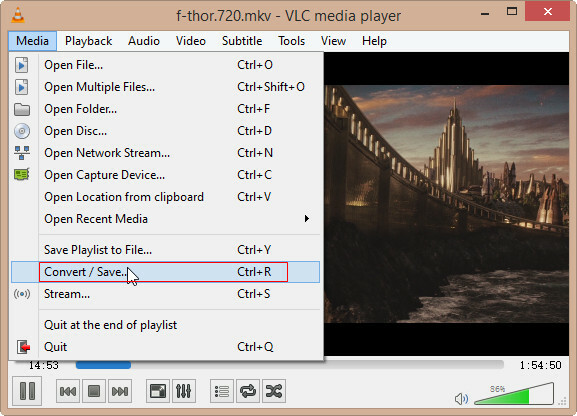 Launch VLC media player, open the "Media" button, and click the "Convert/Save" option. 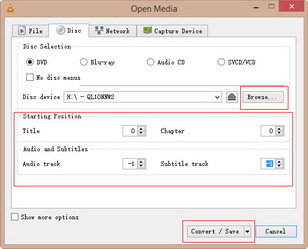 On the popup "Open Media" window, under the "Disc" tab, select "DVD", click "Browse" button to open Video_TS folder from source DVD disc inserted into the DVD drive. Then, finish the "Starting Position" and "Audio and Subtitles" settings. After that, click the "Convert / Save" button. On the "Convert" panel, complete the "Settings" part and click the "Browse" button to set output directory and give output file a name.After that, click the bottom right "Start" button. 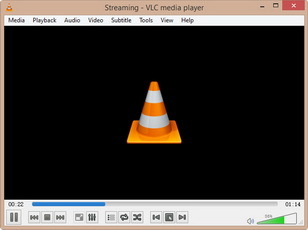 VLC media player would start to stream DVD to PC. As mentioned above, VLC media player could only support to copy video from DVD to PC that’s regular or homemade. If you want to copy protected DVD to PC, VLC media player would fail. In such condition, you could use DVD to PC copy software like Leawo DVD Copy, a reliable DVD copy software program that could copy DVD to PC easily, regardless of disc protection and region restriction. ☉ Support 1:1 disc duplication, movie-only DVD backup, etc. Download, install and run Leawo DVD Copy on your PC via the links above (You’re downloading the ultimate app, in which Leawo DVD Copy is included as a function module). Get source DVD disc ready and make sure your DVD drive works well. Insert source DVD disc into DVD recorder drive. Launch Leawo DVD Copy, open the "Copy" tab, and click the "Add Blu-ray/DVD" button to load DVD disc from DVD disc drive. After loading source DVD disc, choose copy mode from "Full Movie", "Main Movie" and "Custom Mode" and set output disc type from DVD-9 and DVD-5 at the bottom left corner. Full Movie means to copy DVD to PC completely, Main Movie means to copy DVD main title (the longest title by default. you could choose desired one as main title) to ISO file, while the Custom Mode enables you to freely choose DVD title(s) so as to copy DVD to PC. If you choose Main Movie or Custom Mode, you’re able to select subtitles and audio tracks you prefer for output. Click the big green “Copy” button. On the popup sidebar, set “Copy to”, “Disc Label” and “Save to” option. Since you need to copy DVD to PC, select either "Folder" to copy a DVD to PC in a DVD folder or choose "ISO File" option to copy DVD to PC in an ISO image file under the "Copy to". Click “Copy” button on the right sidebar. This DVD copy software would start to copy DVD to PC immediately. Besides using DVD copy software to copy DVD to PC, you could actually use DVD ripping software app to backup DVD to PC as well. The difference lies only in the output file type. DVD copy software would retain the DVD format of output file, while DVD ripping software would change DVD to video files, but you could then play DVD on more players and devices. Leawo’s DVD Ripper could help you easily backup DVD to PC by decrypting, ripping and converting DVD to video files in 180+ video formats. With Leawo DVD Ripper, you could find it’s realy easy on how to copy from DVD to PC and watch DVD on different media players. 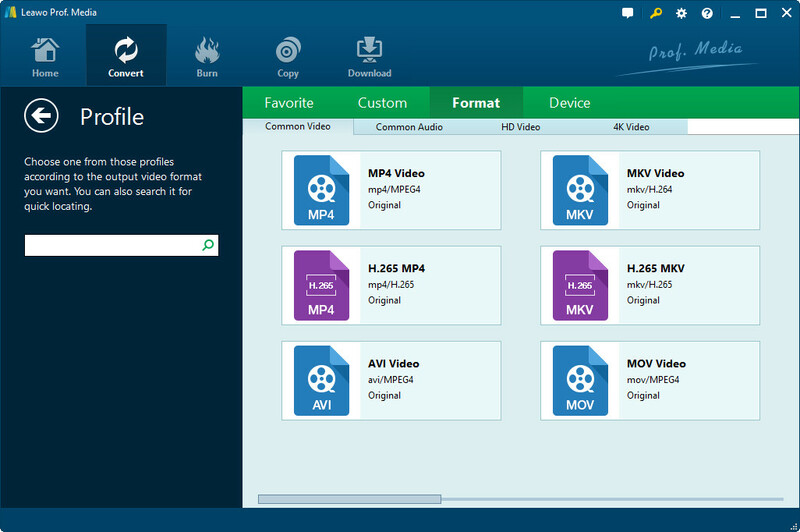 ☉ Convert DVD to video/audio files like MKV, MP4, AVI, FLV, RMVB, etc. ☉ Convert DVD to iPad, iPhone, Android devices, etc. ☉ Edit and customize DVD video files with built-in video editor. ☉ Add 3D effect with the built-in 3D movie creator. ☉ Select subtitles and audio tracks from source DVD movies for output videos. The below guide would show you how to copy a DVD to PC with the help of Leawo DVD Ripper. Beforehand, you need to download and install this DVD ripping software on your PC. Also, get source DVD disc ready, and make sure your DVD drive works smoothly. 1. Insert DVD disc into DVD recorder drive and then open the "Convert" tab to click "Add Blu-ray/DVD" button. 2. After loading DVD main movie or desired DVD titles, click the drop-dwon box right before the big green "Convert" button and then select "Change" option to set output format from "Format" or "Device" group according to your real needs. 3. Click the big green "Convert" button on the main interface. On the popup sidebar, set an output directory to save output video file in the "Save to" option. 4. Click the bottom "Convert" button on the popup sidebar to start copying DVD to PC easily. Upon loading, you’re provided with 3 different loading modes: Full Movie, Main Movie and Custom Mode. Select desired one. Main Movie mode allows single choice to let you select one DVD title as the main movie, while Custom Mode allows you to select multiple DVD titles. You could also freely select subtitles and audio tracks after you choose "Main Movie" or "Custom Mode". To decrypt and rip DVD discs, internet connection is required. In all these 3 ways, you may wonder the best way to copy DVD to PC. Well, to let you know more about these 3 methods for copying DVD to PC, we’ve made a comparison between these 3 ways below. Note: This tutorial offers only feasible solutions to copy DVD to PC for backup or personal use, with no intention of encouraging you to break local laws for removing DVD disc protection. So, check your local law upon DRM protection first and make sure you’re copying your own DVD discs for no business purposes.